Worth Garden's 4 Tier Mini Greenhouse is a functional item for growing plants indoor and outdoor. 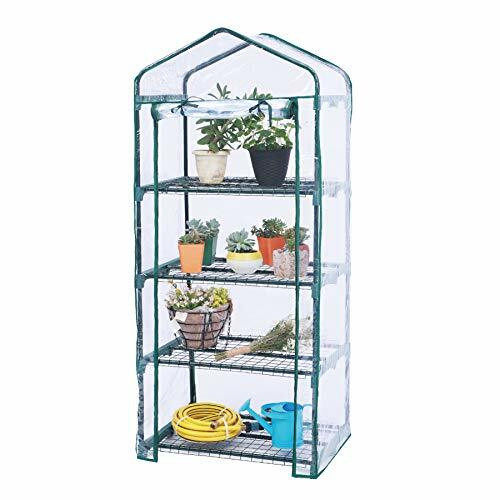 √This easy to assemble greenhouse comes with metal frames, 4-tier shelves and a transparent plastic cover with zippers. It is built with a strong base to ensure all your plants are protected from rough weather conditions such as rain, wind, and snow. √4-Tier Greenhouse gives your seeds, seedlings, and young plants an early start in this compact fashionable greenhouse. It is ideal for small backyards or homes where space is issue. √Because of good quality construction and materials,It can last many seasons. √Folds up easily into a compact storage bag for transport. The assembly of this product requires no tools to be use. Your greenhouse will be built be you know it! √It measures 27 in. L x 19 in. W x 63 in. H .And the thickness of PVC cover is 0.12 mm. DIMENSION - 27 in. L x 19 in. W x 63 in. H ; max loading capacity : 40 lbs. WORTH GARDEN offers an UNBEATABLE consumer-friendly 3-year GUARANTEE on all our Gardening products. Please call 877-271-2007 Monday-Friday 9 am - 5 pm EST or email service@worthgarden.com with any issues.